We are currently in the process of sending out personal tax organizers. Organizers are sent out based on your preference. If you would like to change how your organizer is delivered, please contact Linda at lwalker@alliedfp.com. If you have not received your organizer by January 31, 2018 please contact our office. The IRS does not initiate contact with taxpayers by email, text message or social media channels to request personal or financial information. If you receive a call like this do not provide any personal information . For more details about Tax Scams, or to report a scam, visit the IRS website by clicking here . Quarterlies: January Payroll Quarterlies will be posted to your business portal by February 5, 2018. W2 Distribution: Hard copies of employee W2s will be mailed to employers for distribution. 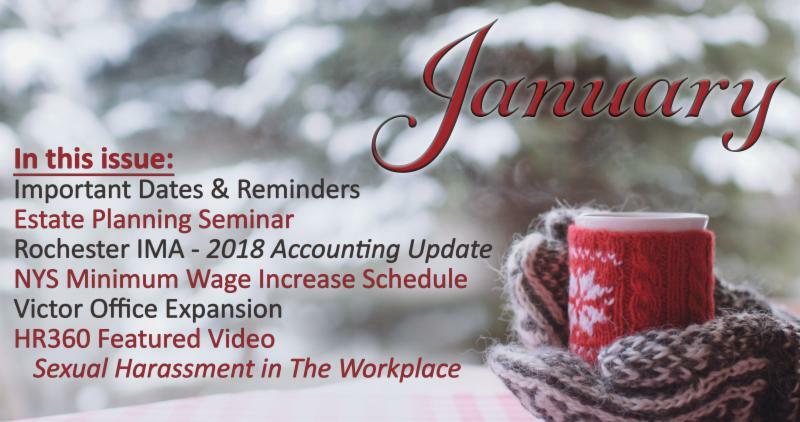 If you have not received the W2 packet for your employees by January 31, 2018 please contact your payroll specialist . Allied Financial Partners aims to present educational seminars that our clients find relevant, valuable and informative. We hope that you will join us for the first seminar of 2018 - Estate Planning. Presenter Marcus Kroll, Esq. of Kroll Law Firm, LLP, will be addressing the most pressing concerns regarding effective estate planning. Ensuring that your wishes are carried out according to your specifications. Learn what documents are necessary to have in place. How to organize your affairs so that they don't become a burden for the people you love. Hor d'oeures & cocktails will be available for attendees at no cost. Space is limited! Please RSVP by February 15, 2018 to Andrea True at (585) 410-6733 ext. 103, via email at atrue@alliedfp.com or by clicking here . We will do our best to accommodate everyone who is interested in attending. I f you are unable to attend the seminar but would like information, or to speak with someone regarding Estate Planning, we would be happy to assist you. Please contact Andrea True at (585) 410-6733 ext. 103. The Institute of Management Accountants - Rochester Chapter is hosting a 2018 Accounting Update on January 24, 2018 at the Irondequoit Public Library from 9:00 AM - 1:30 PM. A don't miss opportunity to get all the latest news on tax updates, nexus issues, revenue recognition, and lease accounting from three experts in their fields. Participants receive four hours of CPE credit through the Institute of Management Accountants. Jason J. Mayausky, CPA, Partner at Allied Financial Partners will be presenting the Revenue Recognition Update, which will change the revenue recognition methods for any organization that has contracts with customers. Tickets to this event are $15.00 - $17.50 and can be purchased by clicking here . Effective December 31, 2017, the New York State minimum wage rates will be increasing. For complete information about New York State's Minimum Wage click here . To make room for our new staff and expanding client base we busted through the back wall of our Victor office! 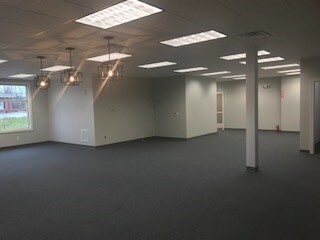 Construction has just been completed on our new space and we are in the process of moving and re-organizing our work stations - just in time to be settled for tax season! Ask for a tour the next time you are in the Victor office! Securities offered through Cambridge Investment Research, Inc. a broker-dealer, member FINRA / SIPC , Investment Advisor Representative, Cambridge Investment Research Advisors, Inc. a Registered Investment Adviser. Cambridge does not provide tax services. Accounting, Payroll, Fixed & Health Insurance, and HR Services are offered through Allied Financial Partners. This communication is strictly intended for individuals residing in the states of AZ, CA, CO, FL, IL, NC, NY, PA, TN, VA and WA. No offers may be made or accepted from any resident outside the specific state(s) referenced. Cambridge and Allied Financial Partners are not affiliated.